Our range of products include new concept kitchen (i land style), i land kitchen, stainless steel modular kitchen with microwave, designer island units kitchen furniture and island units kitchen. Our product range encompasses elegant modular kitchens, stainless steel modular kitchen, New Concept Kitchen (I Land Style) and island kitchens. These products are highly appreciated for features like reliable performance,rigid construction,corrosion resistant finish, sophisticated designs, elegant looks,longer service life,optimum quality & excellent performance,these are widely used in kitchens,hotels,restaurants,& industrial canteens. We export our products all over the world. 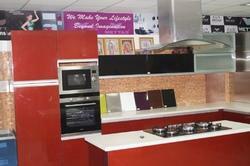 Manufacturer & Exporter of Stainless Steel Modular Kitchens for Homes. 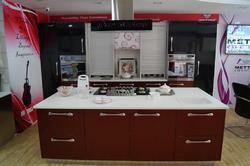 Our product range also comprises of Stainless Steel Modular Kitchens, Elegant Modular Kitchens and Island Kitchens. We manufacture and supply quality Stainless Steel Modular Kitchen with Microwave which makes work in the kitchen easier. 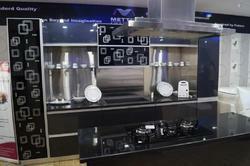 It contains a premium quality microwave oven and multiple gas burners within a gas stove. It also contains lift up wall units which help in storing kitchen accessories in an organized way and makes it easily accessible. 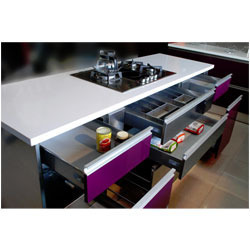 It is spacious and manufactured using high quality stainless steel. 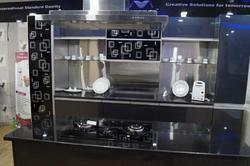 We offer wide range of Designer Island Units which includes sinks, cabinets, trolleys, gas stove with five burners. It is sleek and easily accessible. It is highly durable and stain resistant. It comprises of a middle table and multiple cabinets. It is ideal for small spaces. With the efforts of our professionals, we are able to manufacture superior quality Island Unit. 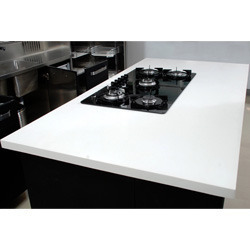 These Island Unit are made from high quality of raw material which ensure durability at its user end. These product are available in market at competitive rates. Looking for Island Kitchens ?